I’ve used this quote a number of times now on this blog, it’s a great way of pointing to how ruins and associated ‘left-behind-pieces’ can trip you up – in the built environment, life or otherwise. I will be using the quote again this Friday as I take a group of Paul Dobraszyczyk’s students on a tour of Sheffield’s ruins, as part of their ‘Ruin Lust’ module. But what’s really struck me in preparing this itinerary is how my adopted city’s once seemingly stable and dependable ruins are suddenly and rapidly disappearing. Empty hulks I’ve wandered past year after year with my own students, orienting them to the city that they are going to be learning about as surveyors, are on the move. My ‘old familiars’ are now either lying demolished, sitting freshly shrouded in scaffolding or re-clad and repurposed to some funky ‘meanwhile’ use or other. Now, for many this is ‘progress’, and the erasure of ruins is another index of development, on a par with (for the Futurists) factory smoke as a sign of modernisation or (for surveyors) tower cranes as a pointer to the state of a city’s property market. On Sheffield’s low-level skyline I still see few tower cranes, and only a little smoke, but this fading away of once dependable ruins is a sure sign of something afoot, and it certainly offers up a provocation: that of the ruin of ruins, of their vulnerability to erasure at any time other than the depth of an economic slump. I’ve been trying to work out how I feel about this ‘loss’. Ambivalent is the best word I can find. I miss the familiarity (and informality) of ‘my’ ruins, but I also see the dangers of fetishising broken-ness, emptiness and uselessness. I guess it’s a bit like a meal – you need some ruins in the urban matrix as hot chillies to challenge the bland functional wholesomeness of the majority of the cityscape, but just as a plate full of chillies would not be a nourishing meal, a city full of ruins would be too much. Striding around Liverpool last year with a surveying colleague and a group of my students, our guide urged us to see whole streets as tired and in need of an abrupt and unapologetic change. Whilst the vitriol was directed at shabby 1960’s office blocks, the register was reminiscent of the aggressive agents of Post-War change who saw the slum clearance bulldozing of dilapidated terraced housing as a proud step towards a bright new future. Gesturing towards these under-occupied office blocks, my colleague declared their current uses unsustainable, the building types outmoded and these flat streets going downhill fast. Yes, there were enclaves of heritage buildings that could be kept for posterity, but much of the real estate assembled in this quarter was dismissed as simply a waste of space. My colleague’s eloquent reaction typified the ‘ruinphobia’ that (much more so than ruin lust, or ‘ruinphilia’) drives the lives and fates of most of the built environment. In the spring I spoke at Paul’s conference at the University of Manchester on ‘Big Ruins’ and offered up there some early thoughts on the pervasive influence of ruinphobia. First, by questioning the unstated assumption that emptiness and dis-use are problematic. This requires an analysis of the latent ruinphobia that lies at the heart of the policy agenda and finds its expression in the policy’s links to the social sciences (e.g. Wilson & Kelling’s ‘broken window theory’ of crime caused by urban dereliction), in community governance measures such as the Clean Neighbourhood & Environment Act 2005, and the embers of slum clearance (Housing Market Renewal). This fear of emptiness (and its related Protestant ethic of full utilisation) is palpable (and unquestioned) in The Portas Review, in the 2007 abolition of empty premises rate relief, in the ‘bedroom tax’, in the proliferation of charity shop and other ‘meanwhile’ occupancies. Secondly, by exploring the bluntness of ‘temporality’ within the planning law and policy system and its implications for use-forcing. Here ‘temporality’ is used in two senses – both as an awareness of the passage of time, and more specifically in acknowledgement that law attaches to familiar-sized moments – phases of use. Our contention is that for all its talk of planning (which implies a command of the future) planning law and policy has only limited effective reach across time (for it cannot force development to occur, merely channel the development aspirations of other stakeholders) and that it also rests upon a specific time horizon – that of the ‘medium term’. Consents are granted without time limit (but implicitly anchored to the 20 years or so likely life of a building) or are restricted to a handful of years. The planning system is not set up to act or think in terms months – its notion of temporary being confined to 28 days (a nod back to pre-industrial fairs, hunting seasons and the like). I’m also starting to think through how different people see ruins differently, and at different times and a variety of scales. In part this is prompted by an invitation from the Institute of Archaeology at University College London, to speak there in March 2015 as part of a series of guest lectures on multidisciplinary perspectives on ‘the contemporary’ and heritage. I’ve proposed as my title “Make, use, abandon, repeat: thoughts on entropy and the temporalities of real estate”: and I’m thinking that I’ll try to offer up there some insight into how the real estate industry’s particular sense of past, present and future affects its engagements with the built environment. The ‘contemporary’ is a function of notions of both the past and the future acting upon (and or creating) as sense of ‘the present’. I’ll try to go further and show how rival temporalities are at work in forming, sustaining and/or changing the built environment. I’ll illustrate my talk with reference to some sites and surplus-to-current-use property types (likely a mix of ruined bunkers, quarries and cotton mills). Paul’s students are art historians (hence the focus on ruin lust). The humanities has dominated academic ruin-talk in recent years, but potentially the tide is now turning (towards balance and collaboration I’d hope, rather than a ditching of the ruin-positivity brought in from the arts). As I flagged in my ‘Ruin of Ruins’ talk at Paul’s conference, political economists are entering the fray and arguing that a focus on the aesthetics of contemporary ruins has stifled analysis of the causes and consequent processes of ruination. The decontextualisation of ruinous objects, and/or insufficient attention to their ‘site stories’ is a fair criticism, but ‘affective’ ruin-scholarship has increasingly acknowledged the dynamic – and processual – nature of the material forces (many of them elemental) by which buildings and their component materials are degraded. But amidst this tussle the irony I live with is that I’ve done very similar circuit walks with my real estate students. The same buildings, but with a change of gazes, resulting in very different readings for those structures. The temporalities are different too. The trainee surveyors look forwards to what the dilapidated building could become. I suspect Paul’s students will tend to look backwards, to what remains of what once was. In other words, development site vs evocative ruin. And my students know that an untended building will quickly fall into ruin. 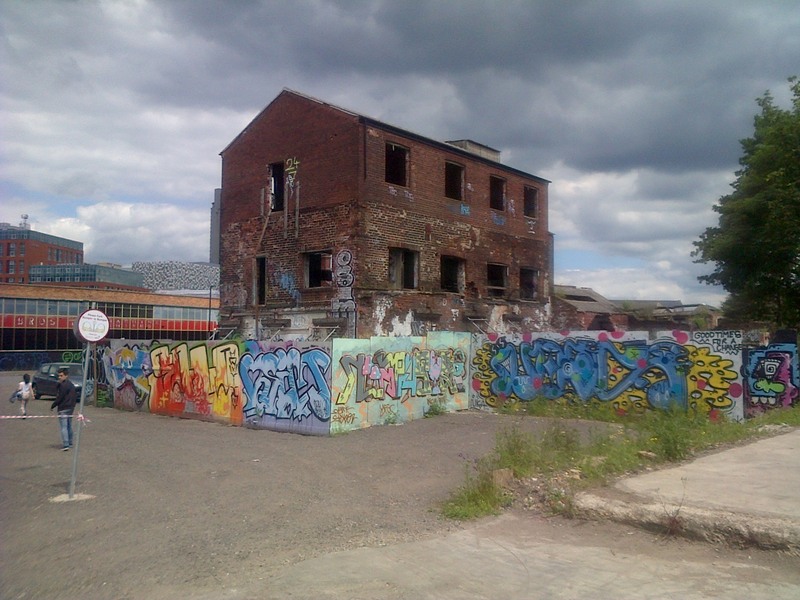 In Sheffield – partly given the shrinking ruin-base, and also the tendency for our buildings to be small and low to the ground – both types of spectator need to be broad minded in order to actually spot empty or underused buildings. Both communities are stuck in the ‘traditional’ mindset – namely that ruins will be broken castles or cathedral-like industrial monoliths, that they will be empty keeps and abandoned dark satanic mills. More likely here in Sheffield however, ruins will be hollow 1960s offices, empty municipal buildings and/or surplus retail units. And these places only coyly betray their ruinous nature. The rot sets in subtly at first, the signs of early stage abandonment visible only to the expert eye. Rotting window frames, bird nests clogging drains, grime gathering on now uncleaned windows. This is how ruins start, as Tim Edensor helpfully explained at Paul’s conference for the benefit of ruin-scholars (it’s something my students and surveying colleagues knew all along) ruination is a process that takes over when the work of care necessary to keep it at bay is stopped. Thus a building enters its ruin phase as soon as care is withdrawn (or substantially reduced). Thus perhaps to find Sheffield’s ruins I need to adjust my expectations. I need to look for the subtle ruins and I need to look for them in the empty units of shopping parades, above street level in the vacant floors sullenly stacked upon still thriving ground level shops. I need to look for them in the heart of the city, not in its industrial periphery. And when I look for them that way I find a fair few, and many of them are Listed Buildings – kept ‘alive’ but gravely ill by the iron lung of heritage protection. But for what purpose? Perhaps my colleague was right, “erase it all”. Perhaps, as Rodney Harrison (2013) puts it we are suffering from “a ‘crisis’ of the accumulation of the past” (580), that we have become too obsessed with “not forgetting” (581), perhaps we just need to let some of this stuff go lest we otherwise suffer an overload of different pickled pasts piling up round us, “constantly surfacing and intervening in our present” (581). Perhaps we need to remember to forget, and to periodically remind ourselves to check whether a protected building or monument is still meaningful for us or can now be released from its suspended animation. It is certainly notable that the only ruins that I can think of as not presently disappearing in Sheffield are those that are listed. So, perhaps after all there is still some ruin lust left in Sheffield’s policy circles (Reed 2014), and ruinphobia does not always win the day. Harrison, R. (2013) ‘Forgetting to remember, remembering to forget: late modern heritage practices, sustainability and the ‘crisis’ of accumulation of the past’, International Journal of Heritage Studies, 19 (6): 579-595. Hatherley, O. (2010) A Guide to the New Ruins of Great Britain, Verso: London. Waddington, C. (2009) Discovering Sheffield Castle – A prospectus for excavating and presenting Sheffield’s lost castle, ARS Ltd Report 2009/1, Archaeological Research Services Ltd: Sheffield.